SAN FRANCISCO & LONDON – September 25, 2012 – SEGA® of America Inc., SEGA® Europe Ltd. and Arkedo are ecstatic to announce that Hell Yeah! Wrath of the Dead Rabbit™ is available for download today in North America on the PlayStation®Network and is coming to Steam and Xbox LIVE® Arcade for the Xbox 360® video game and entertainment system tomorrow,September 26. Ash, the diabolic “hero” of Hell Yeah, will also unleash his wrath on unsuspecting gamers in Europe next week, on October 3. SAN FRANCISCO & LONDON – September 18, 2012 – SEGA®of America Inc. and SEGA® Europe Ltd. are proud to announce the launch of Jet Set Radio for consoles across the US and Europe! PlayStation®Network users will be able to purchase Jet Set Radio today, September 18, while Xbox LIVE® Arcade and PC gamers will be able to purchase the title tomorrow, September 19. As a Heritage Collection title, Jet Set Radio features bonus content that will delight fans of the series, including fan-contributed graffiti and a documentary that takes a deeper look into the creation of this iconic videogame. SAN FRANCISCO & LONDON – September 17, 2012 – SEGA®of America Inc. and SEGA® Europe Ltd. today announced that the HD remakes of both NiGHTS into dreams…™ and Sonic Adventure 2™ will be coming to digital download platforms this October. On the PlayStation®Network, NiGHTS and Sonic Adventure 2 will be available on October 2 for $9.99 / £6.49 / €7.99 and available on October 5 for 800 Microsoft Points on Xbox 360® LIVE Arcade for the Xbox 360 video game and entertainment system from Microsoft. SAN FRANCISCO – Aug. 23, 2012 – SEGA® of America, Inc. today announced the launch of Miku Flick/02. Currently available on the iTunes App Store, Miku Flick/02 is the second installment in the Miku Flick series of action rhythm games where players flick away the lyrics to some of Japanese Vocaloid sensation, Hatsune Miku’s most popular songs. Miku Flick/02 is available for the iPhone®, iPod touch®, and iPad® on the iTunes App Store for $10.99. SAN FRANCISCO & RIDGEFIELD PARK, N.J. – August 17, 2012 – SEGA® of America Inc. and Samsung Electronics Co., Ltd. today announced the availability of SEGA games on Samsung Apps and its premium mobile game service, Game Hub. Sonic CD™, Sonic The Hedgehog 4™ Episode I and II, and Chu Chu Rocket!™ are available for purchase through Game Hub. Other SEGA titles such as Virtua Tennis™ Challenge and Super Monkey Ball™ 2: Sakura Edition will follow. 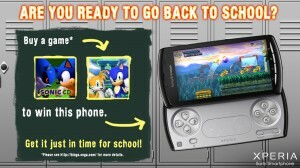 MEDIA ADVISORY: SEGA Makes Prices Academic with a Back to School Sale! SAN FRANCISCO – August 16, 2012 – SEGA® of America Inc. is ringing in a new school year with great deals on hot downloadable titles! For a limited time, popular games like Sonic CD™ and Sonic the Hedgehog 4™ Episode II are available for up to 50 percent off the original price. As a thank you to the loyal fans, all players who spend more than $4.95 (iOS/Android) on Sega Mobile games and send in the receipt are eligible to win a smartphone. For more details about the sale, visit the SEGA blog. Continue reading MEDIA ADVISORY: SEGA Makes Prices Academic with a Back to School Sale! SAN FRANCISCO & LONDON – August 16, 2012 – SEGA® of America Inc. and SEGA® Europe Ltd. today announced the formation of a new publishing initiative, SEGA Alliance. The SEGA Alliance will focus on publishing mobile games made by independent developers. The SEGA Alliance will provide participating developers with comprehensive marketing and production support as well as creative consultation. SEGA Alliance’s first title, Jack Lumber, developed by Owlchemy Labs, launched today on iPad®, iPhone® and iPod touch® worldwide. SAN FRANCISCO & LONDON – August 10, 2012 – SEGA®of America Inc. and SEGA® Europe,Ltd. have initiated this pirate broadcast to announce the release dates and pricing for Jet Set Radio!